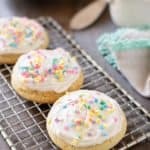 A super soft and fluffy soft sugar cookie recipe, perfect for topping with a homemade buttercream frosting and sprinkles. In a medium bowl, cream butter and sugar together until smooth and light colored. Add egg and extracts and mix until smooth. Stir in sea salt and baking soda. Add flour, half and a time, stirring until fully combined. Using a 3 TBS cookie scoop, scoop dough onto cookie sheets at least 2 inches apart. Let cookies cool on the cookie sheet for 5-10 minutes prior to transferring to a wire rack. When cookies are completely cool, frost with buttercream frosting (optional). *I only get 6 cookies per half-sheet baking pan. **You can also use a 1.5 TBS cookie sheet to make 24 smaller cookies or double the recipe to make 28 large cookies. ***Cookies may be frozen with or without frosting. ****The nutritional information below is for the cookie only. The frosting recipe and nutritional information may be found here.